Loyola’s College of Law begins celebrating its 100th anniversary this month with a number of events celebrating current students and alumni. Established in 1914, the College of Law was initially at Baronne and Common Streets before moving onto the main campus Uptown, where it remained from 1915-1986 when it moved to its current location on Broadway. and many more distinguished law professionals and politicians. Special Collections & Archives is rich in resources related to the history of the College of Law, including the personal papers of alumna and former professor (and New Orleans’ first female law professor) Janet Mary Riley. To see these items and others like them, check out our digital collections or come see us on the third floor of the Monroe Library. Thursday, Feb. 6, 10 a.m.
Thursday, Feb. 6, 5 – 7 p.m.
Matt Shlian, a paper engineer rooted in book arts, print media and design, will launch his new exhibit, Apophenia, at Loyola University New Orleans with a free, public lecture and opening reception. The Apophenia exhibit draws from Shlian’s series of the same name and refers to the artist’s perception of patterns or connections where none exists. Through the lecture and exhibit, Shlian will explore how fine art and design inform one another, as well as how math and science relate to each other. Shlian allows his work to evolve on its own by beginning with an initial fold—a single action that then causes a transfer of energy to subsequent folds—that ultimately manifest in his drawings and three-dimensional forms. Shlian also uses his engineering skills to create kinetic sculpture, collaborating with scientists at the University of Michigan. 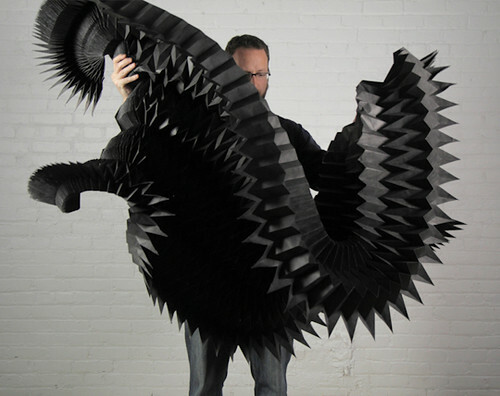 While researchers see paper engineering as a metaphor for scientific principles, he sees their inquiry as a basis for artistic inspiration, according to Shlian. He has presented and conducted workshops across the country, and commissioners of his work include several prestigious organizations and entities, such as Apple, Ghostly International, IMTEK, The United States Mint, The University of Michigan and Queen Rania of Jordan, among many others. The artist’s lecture is part of the Biever Grant Lecture Series. Both events are part of Loyola’s Montage Fine and Performing Arts Series. 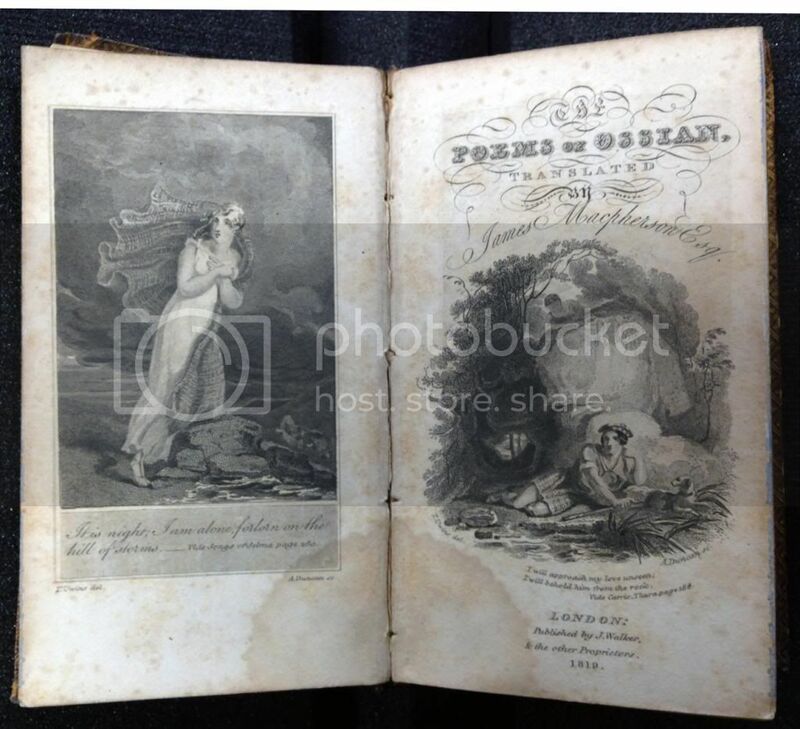 Today’s edition of #minibookmonday presents the The Poems of Ossian. This tiny treasure, measuring 3 X 5 inches, was published in London in 1819. 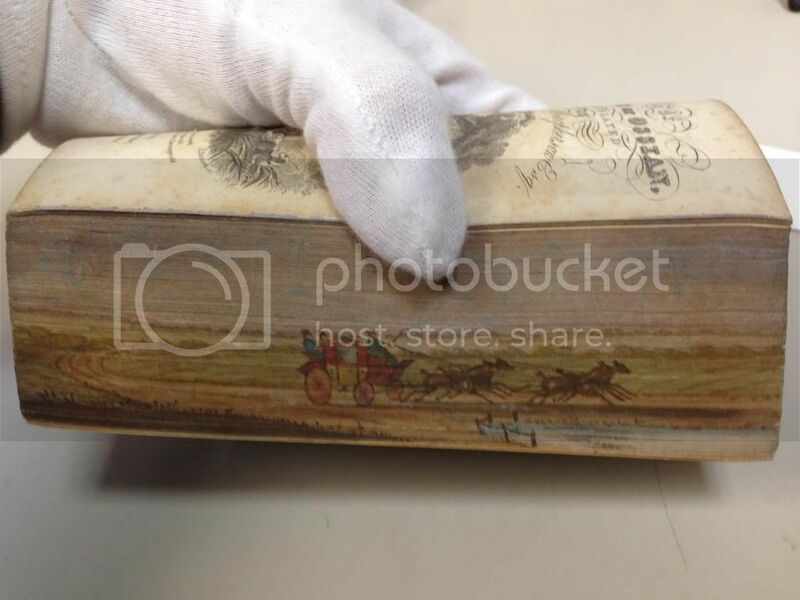 It retains it’s original ornate binding, and features a fore edge painting of horse-drawn carriage seen below. In it’s time, this was clearly a finely crafted book. The Poems of Ossian themselves are less clear. Said to have been “translated” by James MacPherson (1736-1796) from ancient Gaelic texts and the oral tradition of the Scottish Highlands, doubts about the authenticity of poems began shortly after their “discovery” and publication. The charge against the veracity of the poems was largely led by Samuel Johnson, and an official inquiry by the Scottish Highland Society in 1805 supported the notion that MacPherson himself was the author. The controversy did not do much to dampen interest in the poems themselves, as evidenced by the production of the fine volume we feature today. Indeed, the controversy may have made the poems more popular. (Napoleon was said to be a fan of The Poems of Ossian, and to carry copies with him into battle.) Whatever the ethics of Macpherson’s writings, The Poems of Ossian were without a doubt widely read and influential on the Romantic period of the 19th century. Bonus video: scholar Thomas M. Curley discusses his book Samuel Johnson, the Ossian Fraud, and the Celtic Revival in Great Britain and Ireland. Due to severe weather forecasts of freezing rain and snow for the greater New Orleans area, all classes and events at Loyola University New Orleans have been cancelled for Wednesday, Jan. 29. Classes and events remain cancelled today. The winter storm is expected to impact the New Orleans area Tuesday through Wednesday morning, but dangerous road conditions may persist through Wednesday evening. A mix of snow, sleet and freezing rain is expected. All buildings on campus will be closed Tuesday and Wednesday with the exception of residence halls and the Danna Student Center, which will remain open to serve student needs. All non-emergency employees are asked to remain at home Tuesday and Wednesday. Access to buildings will be limited to emergency personnel only. Please continue to monitor the Loyola homepage for official updates. You may also call Loyola’s Emergency Information Line at 504-865-2186. 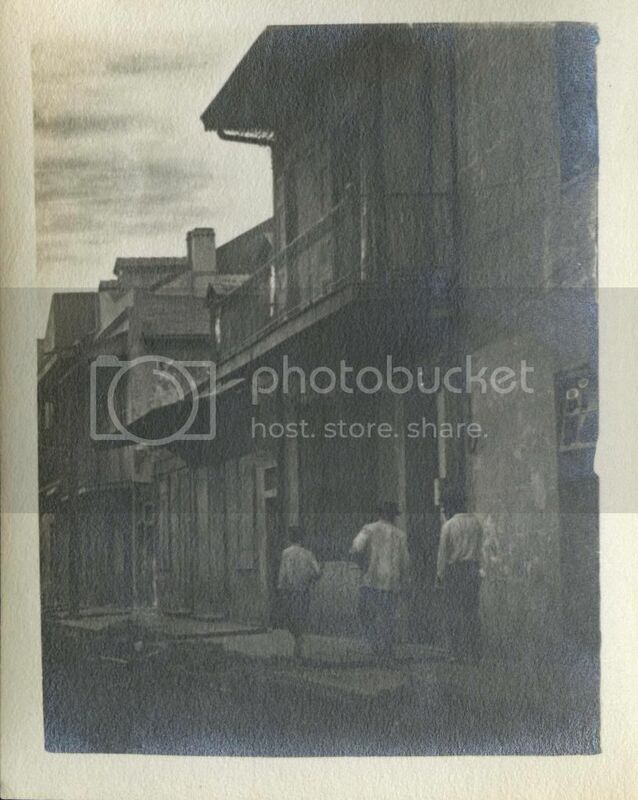 Another series in The Collection of Historic New Orleans Miscellany includes some undated photos of the French Quarter, possibly from the turn of the century. 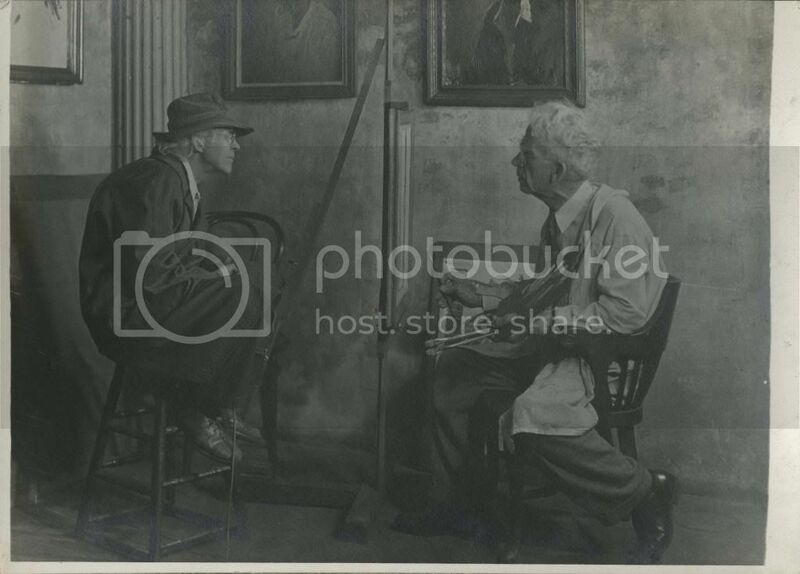 As can be common with an artificial collection, we don’t know who these photos came from or what exactly they’re of. If you recognize a person or place, leave a comment below! 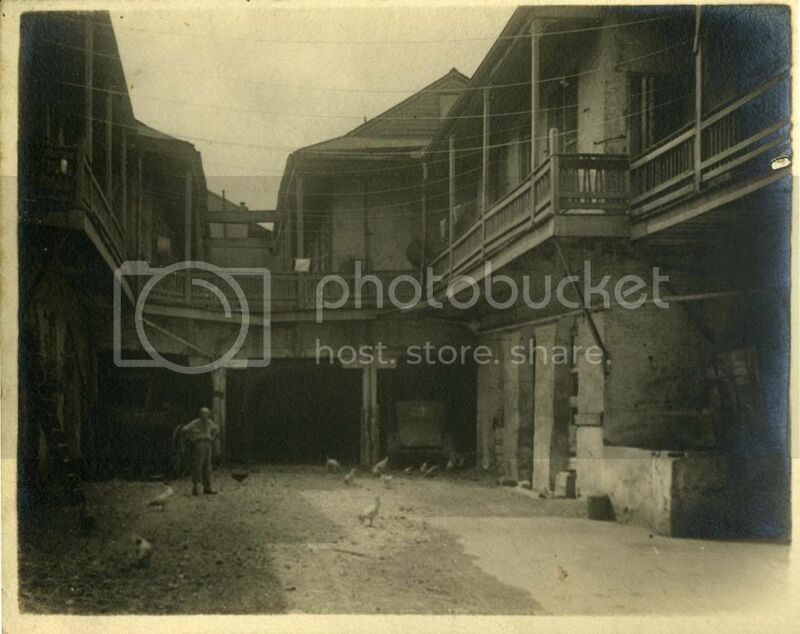 More historic French Quarter photos as well as New Orleans ephemera, documents, and maps can be seen in this collection in Special Collections & Archives. 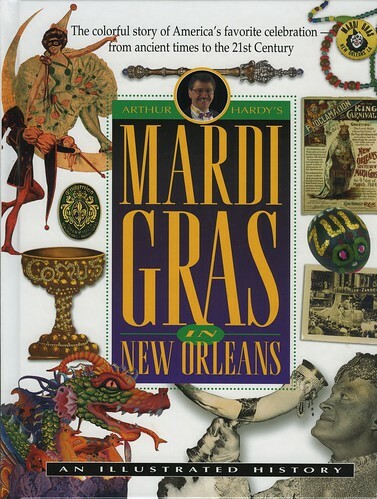 As Carnival season heats up and the parades start to roll, it might be fun to delve into the history of Mardi Gras, not just from our current perspective, but from that of years past as well. In the Special Collections & Archives department of the Monroe Library we have Mardi Gras literature from as far back as 1887! 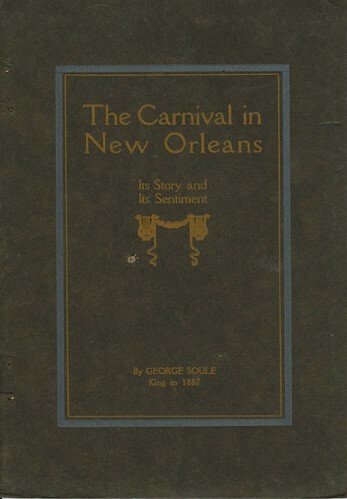 Read about the story of Carnival in New Orleans by the King of Rex, George Soule, written in 1887. 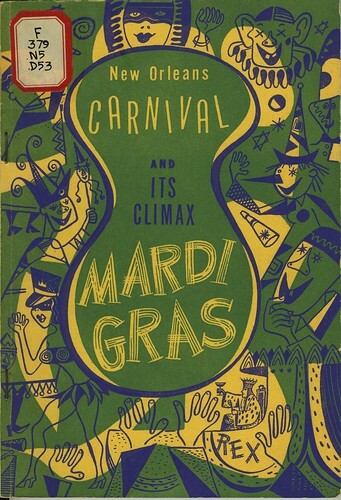 Learn what Carnival was like in the 1950s with, New Orleans Carnival and Its Climax Mardi Gras, by Thomas Di Palma, 1953. 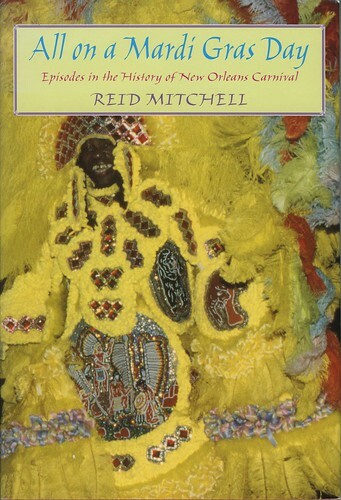 Read some of the most intriguing stories of Carnival since 1804 in Reid Mitchell’s, All On a Mardi Gras Day, 1995. 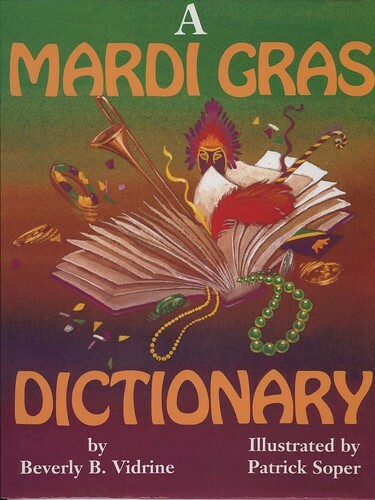 Share Mardi Gras with your siblings or children with the picture book, A Mardi Gras Dictionary, by Beverly White, 1997. Get the full story from New Orleans’ own Mardi Gras authority by reading Arthur Hardy’s Mardi Gras In New Orleans, 2001. 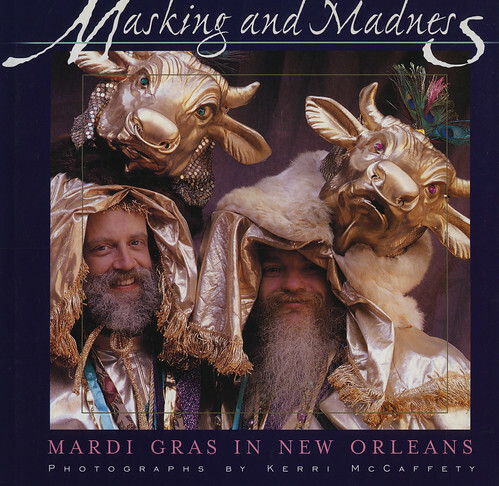 Or just look through some amazing Mardi Gras photography in, Masking and Madness: Mardi Gras In New Orleans, by Kerri McCafferty, 2002. All these titles and more can be found in the Monroe Library’s Special Collections & Archives department. Come on down to read them today! The Monroe Library Friend of the Month for December is Veronica Morse! Veronica is a sophomore Political Science major from Pompton Lakes, New Jersey, and is active on campus as a member of Chi Alpha, Christian Life Community (CLC), Awakening Community, LUCAP, and College Republicans. After graduation, Veronica plans to go to law school, but before that, she may serve in the Peace Corps. Veronica studies, conducts research, writes papers, and meets up with friends in the Monroe Library, as well as using its computers, printers, and study rooms. “I’m in the library more than my room,” says Veronica. Thank you for using the Monroe Library, Veronica, and congratulations on being our Friend of the Month! The Monroe Library’s Special Collections & Archives has recently opened a new exhibit titled, Collection Curiosities. This exhibit features rare and unusual items within our collection. One of those items is a recording on vinyl of an interview with Lee Harvey Oswald titled, Self-Portrait in Red. On August 21, 1963, just three months before he assassinated President John F. Kennedy, Lee Harvey Oswald was interviewed by WDSU Radio in New Orleans. Bill Slatter spoke with Oswald on the radio station’s show, Conversation Carte Blanche, about his thoughts on the political situation with Cuba. At the time, Oswald was the secretary for the New Orleans chapter of the Fair Play for Cuba Committee, known as the principle voice for Fidel Castro in the United States. The recording features the only recorded statement in existence of Oswald’s opinion about President Kennedy. If the cover art isn’t creepy enough, listen to the actual recording here: Side 1/Side 2, or stop by Special Collections & Archives on the third floor of the Monroe Library to listen at our audio station. Special Collections and Archives presents “Collection Curiosities,” an exhibit of unusual and rarely seen items from Special Collections and Archives. This exhibit is loosely inspired by Cabinet of Curiosities (also called Wunderkammer or Kunstkammer) which were early museums in Renaissance Europe showcasing collections of unusual and exotic items. The “cabinets” were actually rooms that showcased wonders of the natural world, art works, and items of unusual or unknown origin. For over 100 years, Loyola University has been collecting books, personal papers, and original materials related to the Society of Jesus, Loyola University New Orleans, the city of New Orleans, and specific fields in which Loyola faculty and alumni have excelled or in which Jesuit values have found expression. While some of the items found in this exhibit fall into these categories, many were preserved simply due to their rare and unique characteristics. Occasionally, even the provenance, or origin, of the item is unknown, making their presence in the collection even more remarkable. These unconventional objects will be on exhibit in the Monroe Library Special Collections & Archives until May 31. Special Collections & Archives has a new collection available of assorted New Orleans memorabilia. 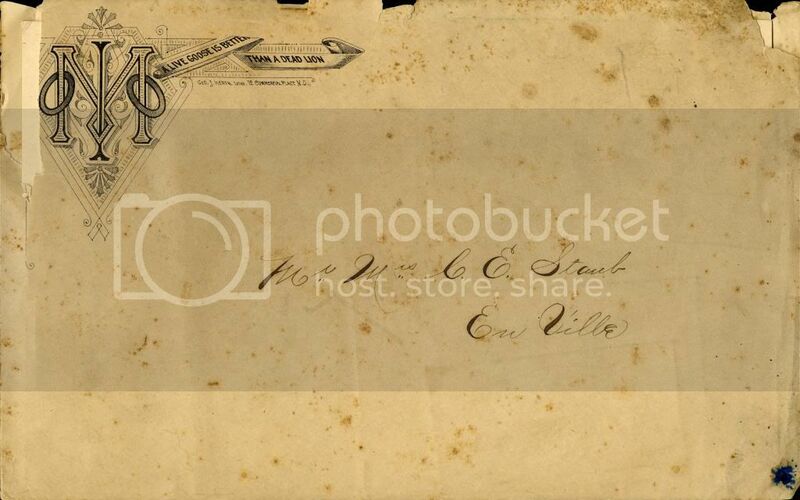 Usually archival and manuscript collections were assembled by a person, persons, or organization because the materials in the collection have research value when kept together. Sometimes, however, we wind up with an “artificial collection,” or one that didn’t grow out of a particular function but instead has been put together to make items easier to use. 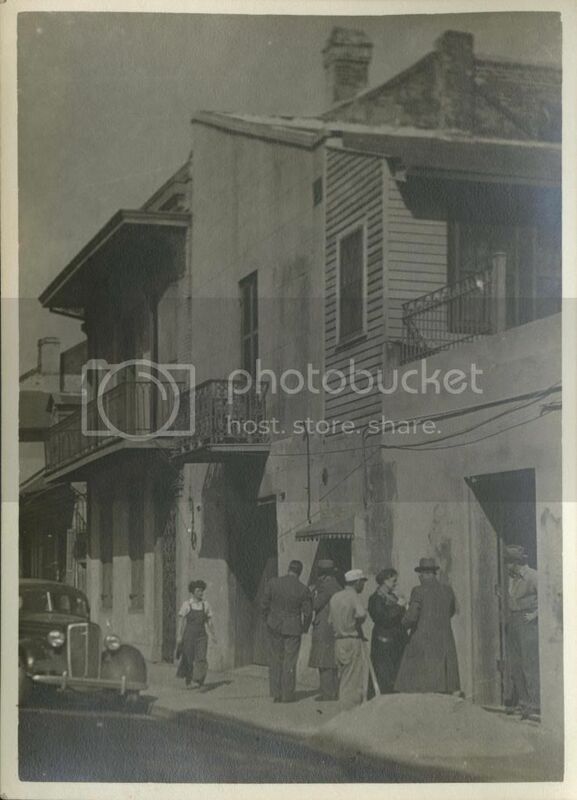 The Collection of New Orleans Miscellany is such a collection as it is comprised of various individual documents, photographs, and other ephemera relating to the history of New Orleans. We’ll be unveiling some of the other items in the collection soon, but for now, we present an invite to the Mirth, Melody & Moonlight ball. 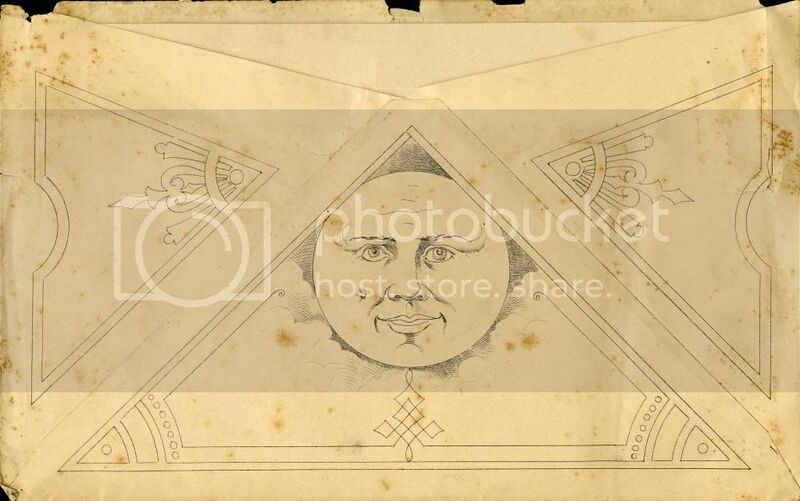 This 1882 invite comes from the Independent Order of the Moon (I.O.O.M. ), a comedic Mardi Gras krewe formed in 1881. The I.O.O.M. followed Rex on Mardi Gras day along with the Phunny Phorty Phellows. 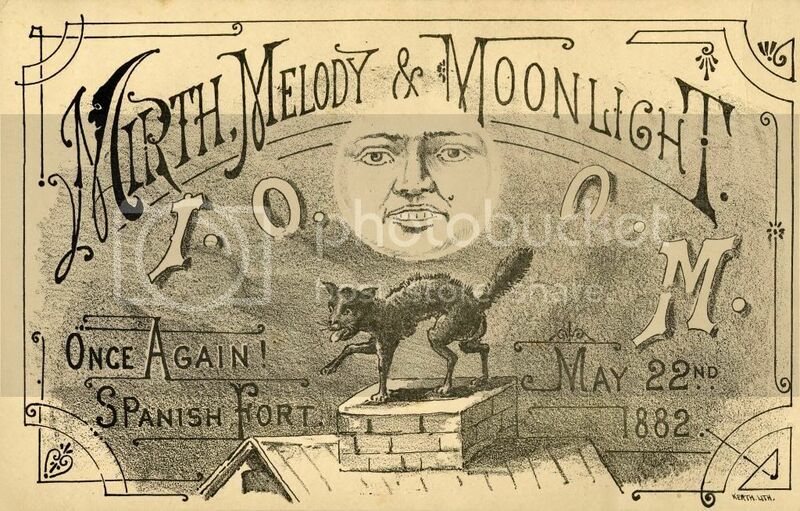 Their theme for 1882 was Mirth, Melody & Moonlight — Scenes from Popular Songs. The ball was held at Spanish Fort, an area where first the French and then the Spanish built forts to protect trade routes through Bayou St. John. From the 1880s to around 1920, the land was used for an amusement park that included restaurants and recreational establishments. 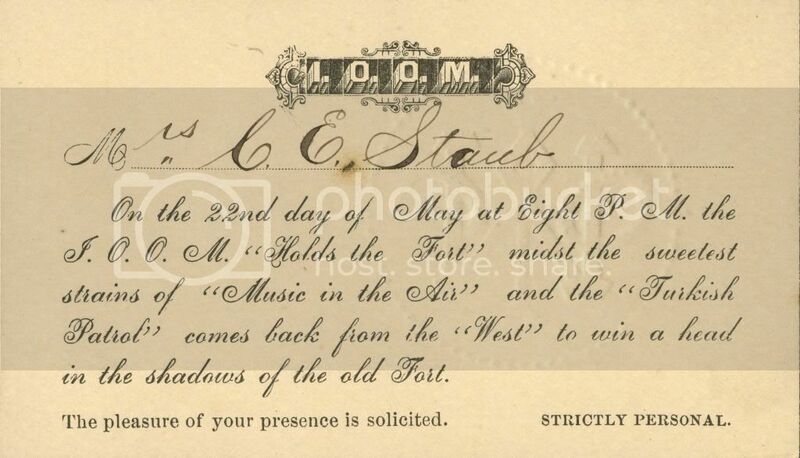 This particular invite was sent to Mr. C.E. Staub, a newsdealer, and his wife. 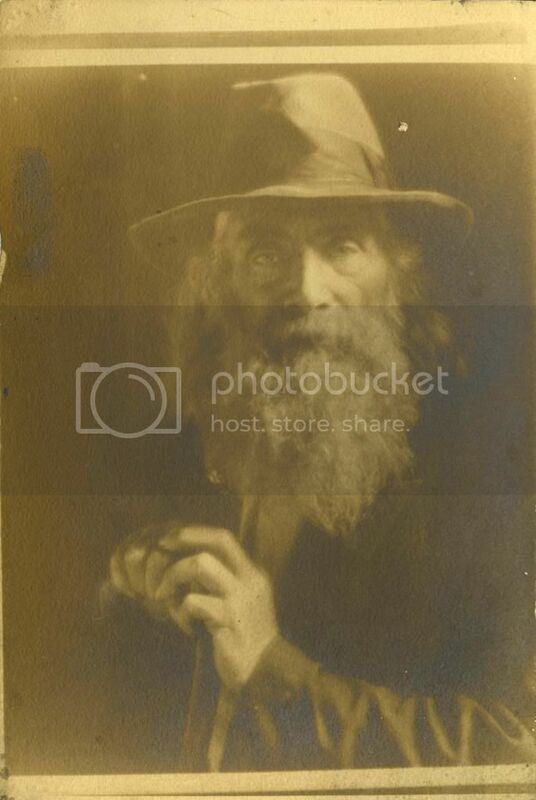 The collection can be viewed in its entirety in Special Collections & Archives. You are currently browsing the Library Lagniappe blog archives for January, 2014.